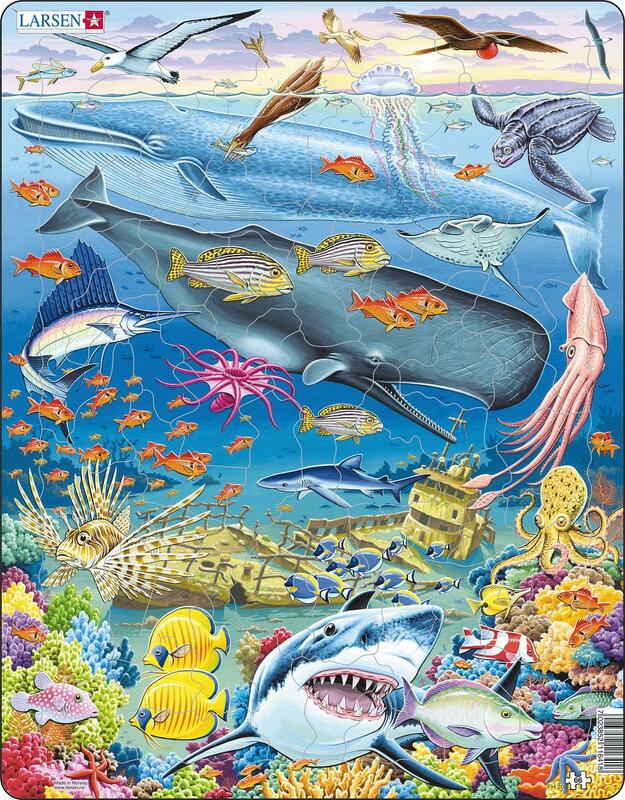 Help your child learn to identify Pacific marine animals with this fun and educational jigsaw puzzle! Species depicted include the following: flying fish; wandering albatross; brown booby (2 diving); pelican; lesser frigate bird; black-browed albatross; blue whale; squirrel/soldierfish (lots; including the shoal middle left -bright red); Portuguese man-o-war (jellyfish); yellowfin tuna(distant at top); leatherback turtle; manta ray; sailfish; Goldman's Sweetlips (horizontal striped); sperm whale; giant squid; lionfish (or zebra/dragon/butterfly/scorpion/turkey fish!! ); blue shark; blue surgeonfish; octopus; long-nosed butterfly fish; red emperor(striped red & white); spotted pufferfish; 2 yellow butterflyfish (left); great white shark; parrotfish(2); various corals; red and blue starfishes; brain coral(bottom right).